A report on Saturday claims Apple is finalizing plans to launch Apple Pay in the UK later this summer, which would mark the in-house payments service's first international offering since rolling out in the U.S. last October. Sources familiar with the matter told The Telegraph Apple intends to announce upcoming UK Apple Pay availability at the Worldwide Developers Conference on Monday, with an official start of services to follow in about two months. According to the publication, contactless spending in the UK jumped to 2.3 billion pounds (about $3.51 billion) last year despite a generally uninterested consumer base. Conflicts within the finance and mobile industries have resulted in disjointed platform offerings, but with a 40-percent share of all UK smartphone sales, the Apple Pay-enabled iPhone could be catalyst for change. Importantly, many UK retailers field point-of-sale terminals equipped with NFC transceivers capable of communicating with iPhone and Apple Watch. Infrastructure was an issue when the service debuted in the U.S., as a good portion of merchants were in the process of rolling out compatible POS hardware. Some companies in the UK —and beyond —are already accepting Apple Pay in an unofficial capacity. For example, overground train and Tube operator Transport of London is processing Apple Pay transactions for American tourists through existing Oyster smart card gateways. Although Apple has yet to provide a detailed timeline, it's a foregone conclusion that Apple Pay services will be extended beyond U.S. borders. Initial evidence came last December in the form of job listings calling for interns to help with a rollout in the EMEIA region. 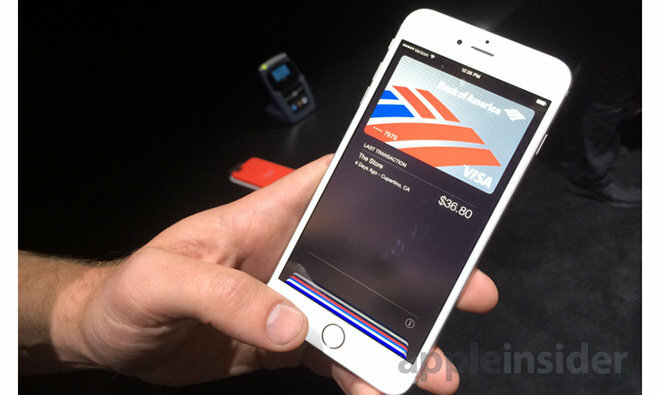 Subsequent reports specific to the UK suggested Apple Pay would launch in early 2015.